I know this is the moment many have been waiting for! Should we be doing the Retro Dance? Should we fork over more loot for another 3 in 1 game system console? Should we be intimidated by the odd space-ship like design that looks like it came from Planet Retron (most likely a Star Trek episode!) ? I try to answer as many questions on the Retron3 that I can possibly fit into an almost 11 minute video. From start to finish we work over the unit to see what type of staying potential it has. So without any further hesitation, let’s cut the fat off the RetroN3 and see if it will earn a place on my classic gaming shelf! Viola. there you have it. That’s basically the system in a nutshell (well or in 11 minutes). Not a bad clone attempt, not flawless by any means but not bad. The one thing I have to say is that you don’t want to even touch those controllers as they look so pretty in the box…and that’s where they should stay! But honestly, why would you want to use those things anyway if you had all those ports on it anyways? As a whole, I would have to say that the Retro Duo is still the best Super Nintendo/Nintendo clone. 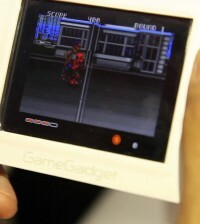 If you want a Sega Genesis clone your better off getting the portable Genesis . We’ll keep testing the Retron 3 and post any new findings that we come across in the forums, so until next time. May the Old Skool be with you! Live long & Prosper!